Next to the last day of my journey and a tough ride in store for me as well. I had hoped to get an early start but I just didn’t wake up in time … that and the fact I just sat around my hotel room in Olney enjoying coffee. I think I was hesitant to leave due to the fact I was about to travel the roads and hills that had defeated me 2 months earlier. 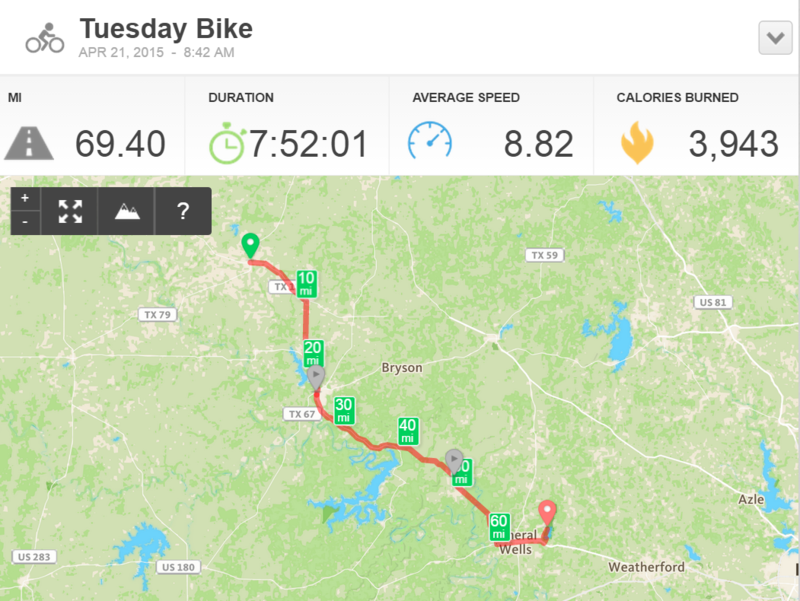 Due to my combining 3 days of riding into 2 … that added an additional 20 miles to the route towards Lake Mineral Wells State Park. I finally dragged myself out of the room and hit the pavement around 8:45 a.m. I knew I had to get this day going! 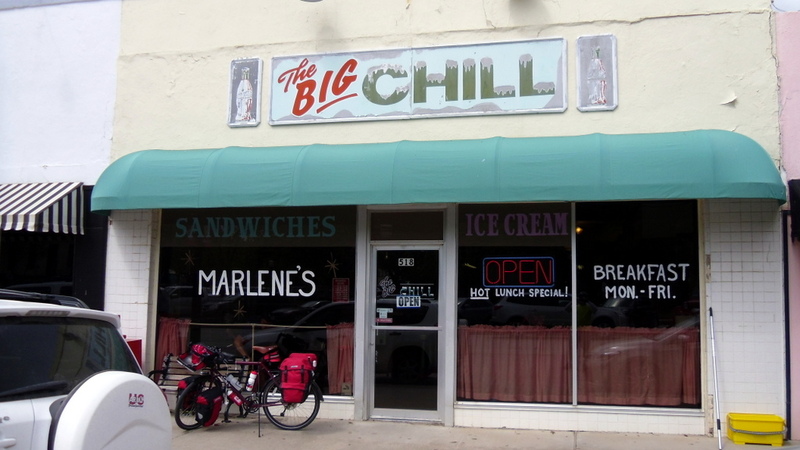 If you didn’t know, I attempted a 4 day, 3 night bike trip that was from my house, Lake Mineral Wells, Graham, back to Lake Mineral Wells and home again. The first day of this trip went fine but the 2nd day when I left Mineral Wells and headed towards Graham on TX 337 I my body succumbed to the hills having to walk my bike up most of them. I finally made it to a filling stations/store at the intersection if TX 337 and TX 254 in Graford, TX where I called my wife Lynne to pick me up. This trip taught me several lessons: loose weight (both gear and body) and get in better shape. It also taught me that biking day after day was MUCH harder on your body than doing a day here and there. 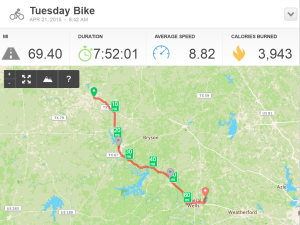 Since this experience I was able to shave off 7-8 pounds from by bike as well as my body. I also started doing spin classes at my fitness center. I mention the back story because it was DEFINITELY on my mind all day. 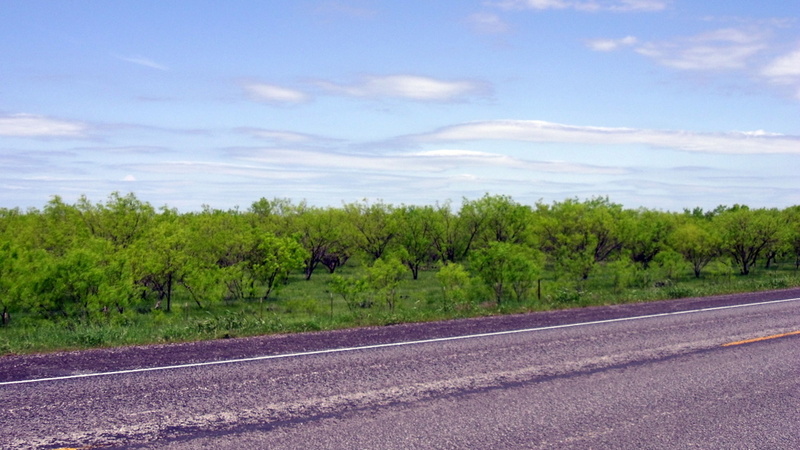 My route out of Olney, TX took me on TX 114 going east. Winds were calm and favorable today. 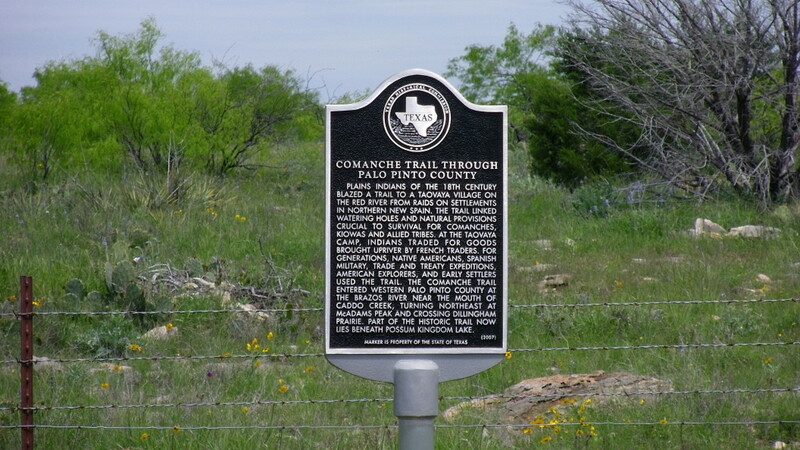 After about 10 miles from Olney the route lead me to FM 1769 going almost due South. 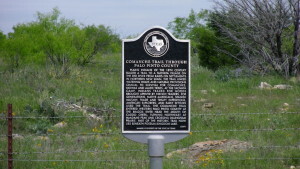 Basically there were no towns along this route but a few historic markers that I took the time to stop and take a break. I eventually road into Graham and stopped a their famous downtown square to have lunch having ridden about 25 miles so far. Lunch was a smothered hamburger steak plate with all the trimmings and of course water. I filled my water bottles up and left. On my mind was that I had STILL yet to traveled the distance to where I was to originally camp. 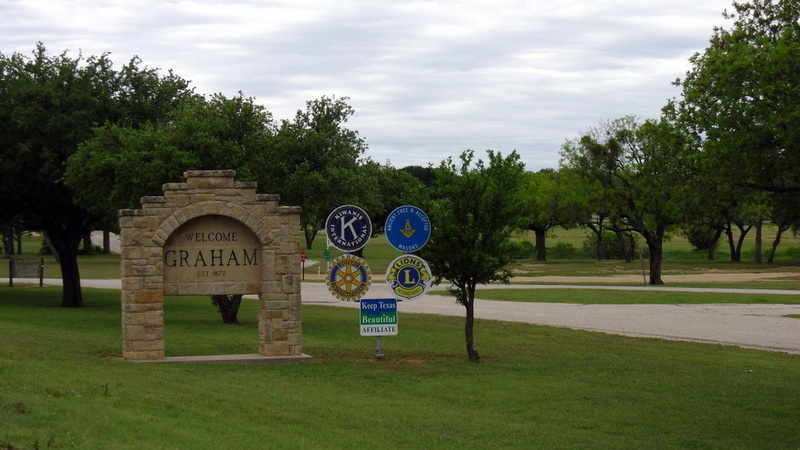 That spot was another 10 miles or so south of Graham. 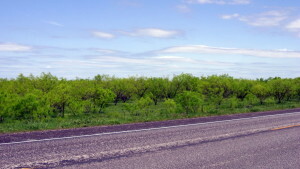 The route took me south on TX 16 for 25 miles to Graford. While I had not biked this section of road, Lynne and I did drive it after she picked me up. It too has some awesome hills. I hope this photo gives some sense of the road and hill to climb on the other side. 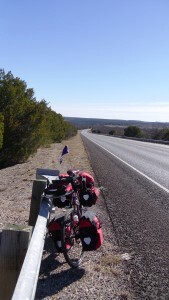 It is actually a beautiful view and ride … and while a very tough climb using my lowest gears, I was able to make it. I finally arrived in Graford to that gas station that Lynne picked me up from 2 months earlier. I took a break, bought some gator aid and sat outside contemplating my nemesis ahead. 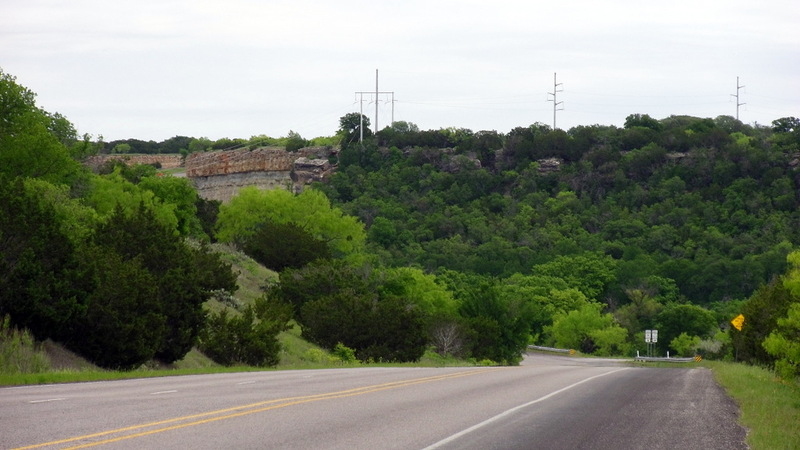 It is only 15 more miles to Mineral Wells but the score was hills 1, Jon 0. It was getting late in the day so I had to move foreword. Off I went on this last leg of the day. 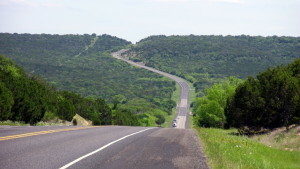 Here I was attempting these hills after already having ridden 45 miles today. I conquered them! I surprised even myself! And it all felt VERY good! 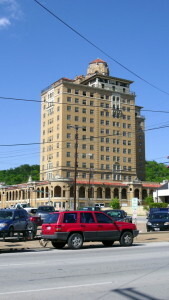 I had to include a photo of the old Baker Hotel in Mineral Wells. 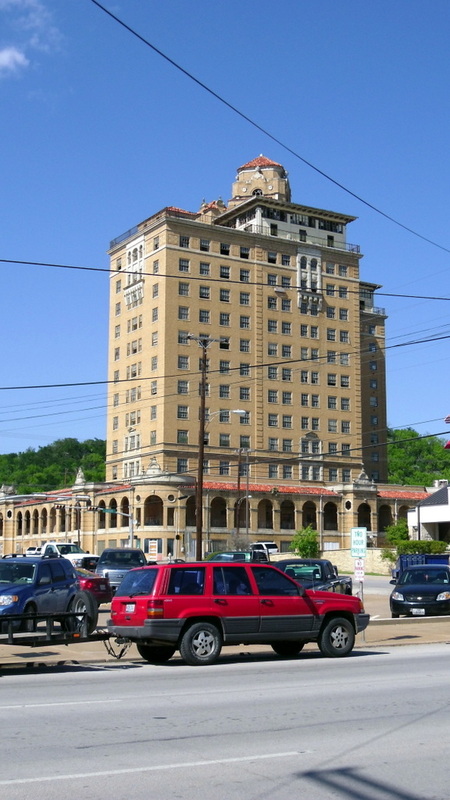 I remember dining there as well as swimming in the pool as a child. I finally arrived at the Lake Mineral Wells State Park entrance at about 4:45 p.m. only to realize they closed at 4:30 p.m. With the potential of rain and all I HAD wanted to rent one of the covered screened in buildings but could not so I ended up in the regular tent camping area. I was really tired after today’s 72 miles so I setup camp, cooked dinner and REALLY enjoyed the Chivas! Rest well and be very careful on your last leg of the trip! Love you! 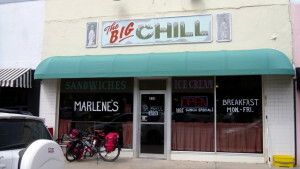 Champagne is on ice and truck is full of gas in case you wimp out between Mineral Wells and home! City of Fort Worth denied my parade permit and there will be no police cars or fire trucks leading the route into town. Wish I could be there to help welcome you home today! So proud of you dad! Love you! Does that mean you are back to work on Friday? J/K.. I have love the pics you put out there. Yes! You conquered the hills of 337. We call those the 3 Sisters. however, we have called them many other names…Lol!